I thought you would welcome an update on the HS2 Scheme. As you are likely to be aware, the HS2 Select Committee has now starting sitting and will begin to hear from petitioners in September. The Select Committee have announced that they will hear petitions on a regional basis and will begin by hearing petitions from the Birmingham area before working south along the route. I do not believe it is likely that any petitions from Buckinghamshire will be heard until early 2015 at the very soonest. I submitted two petitions (petition numbers 1012 and 1013). One of the petitions was a joint petition with Cheryl Gillan, MP for Chesham and Amersham, which specifically calls for an extended bored tunnel through the Chilterns AONB. The second petition covers wider constituency issues including compensation and traffic issues as well as specific mitigation requests for Dunsmore, Wendover Dean, Wendover, Stoke Mandeville, Aylesbury and Fairford Leys. The HS2 Select Committee has a website where details of its public sessions are published as well as transcripts of its deliberations. The Committee’s website address is below. Both STOP HS2 and the HS2 Action Alliance had their locus standi (right to appear before the Committee) challenged by HS2 Ltd. Following this announcement I wrote to Robert Syms MP, Chair of the Select Committee, to urge him to reject the Department for Transport’s challenges and I am pleased that the Select Committee decided to hear both the Action Alliance and STOP HS2’s petitions. If you have submitted a petition I would encourage you to try and watch some of the Committee’s proceedings before you are due to appear before the Committee to try and get an understanding for how the Committee operates. I am happy to speak to any petitioner from my constituency about appearing in front of the Committee once we have greater clarity on when petitions from Buckinghamshire will be heard. Turning to compensation, the Department for Transport has now announced a further consultation which closes on 30 September. The consultation document and details of how to respond can be viewed at the below link or alternatively I am happy to send you a hard copy. The consultation specifically covers compensation for those who typically live 60 to 300m from HS2. The Department for Transport now proposes to offer people living 60 to 120m from HS2 the right to require the Government to purchase the property for its unblighted value or, alternatively, a cash payment to remain in their property. For those living 120 to 300m from the line a cash payment is proposed to provide some recognition of the loss that these people will suffer as a result of HS2. People living 120 – 300m from the line would not be able to require the Government to buy their property, though of course you could seek such improvements in your response to the consultation. The Secretary of State for Transport has also confirmed that a Need to Sell Scheme will replace the Exceptional Hardship Scheme by the end of year. The Secretary of State has also said that the Need to Sell Scheme will be more generous than the Exceptional Hardship Scheme, however, until any detailed guidance is produced it is difficult to say who will be eligible. I will be responding to the consultation and would encourage you to also respond to ensure your views are taken into account. I have already scheduled a meeting with the HS2 Action Alliance to discuss the proposals and have requested a meeting with the Secretary of State for Transport. I will also be speaking to local action groups, Parish Councils and individual constituents about the proposals to ensure I reflect their views as well as my own in my response. Finally, on 31 July I took Sir David Higgins, Chairman of HS2 Ltd, on a tour of the constituency to show him some of the areas that will be affected by HS2. In the limited time available I took Sir David to London Road, Bacombe Lane, St Mary’s Church, Ellesborough Road and Nash Lee Lane in Wendover, to Old Risborough Road in Stoke Mandeville, to Oat Close in Hawkslade, to the Oxford Road and to Fairford Leys. I introduced him to key local HS2 campaigners who explained to him in detail the concerns and worries of local residents about HS2. I was pleased that Sir David accepted my invitation to come to the constituency and listen to the concerns of local people and I will be following up my visit with a letter to Sir David encouraging him to make changes to the scheme before petitions from Buckinghamshire are heard to ensure the impact of HS2 on the local area, both during construction and operation, is minimal. I will continue to keep you updated as the HS2 Hybrid Bill progresses through Parliament. This entry was posted in HS2 on 5 August 2014 by hvrawebmaster. As you will know, on Monday the House of Commons voted overwhelmingly in favour of the High Speed Rail Bill by 452 votes to 41 votes, a majority of 11 to 1. This was not a surprise. The leaders of all the main political parties, down to and including the Scottish Nationalists, support the project. The scale of that cross-party majority means that overwhelming support in Parliament for HS2 will remain throughout this Parliament and the next. The only way that would change is if one or both of the two big parties were to change its policy. Like you, I have enormous concerns about the project. I have profound doubts not only about its environmental impact, but also about the business case behind it. I fought as hard as I possibly could within the Government to present the case against HS2 and I also made sure that every argument put by my constituents was presented forcefully to Transport Ministers and others. Since you first elected me, over two decades ago, I have always tried to act in your best interests. I believe I am doing so now. The reality is I cannot stop HS2. There are too few of us opposed, and too many others in favour. I know it would be popular for me to have voted against HS2. But doing so would not have stopped it going ahead or dented the 11 to 1 majority in favour – and would have damaged my ability to do what is best for the local area. HS2 will have an impact not only on people living in our area, but also on future generations. My duty is to do my utmost to protect our local communities and landscapes along the route. Some of the most critical issues concerning HS2 are still to be decided. For example, decisions on where there will be additional tunnelling, noise reduction, landscaping and screening in particular locations still need to be taken. Important questions remain unresolved on compensation as well, especially on the scope of the Need to Sell scheme which needs to be a lot more wide-ranging than the Hardship Scheme. The rules currently proposed for compensation to business and to small landlords also need improvement. Add to that the issue of how we can get some benefits for our area, like a good share of HS2 apprenticeships and contracting opportunities, as well as improvements to our local road and rail infrastructure. People in Buckinghamshire are being expected to shoulder a very heavy cost for a project that will bring no direct benefit to our area. It’s only right and fair that we should seek both to limit the costs and secure benefits to individuals and communities as compensation. I thought long and hard about what I should do at Second Reading. I came to the conclusion that while resigning and voting with the small minority who opposed the Bill would win me some short-term applause, it would make no difference to HS2 being approved at Second Reading, but would harm my chance of getting the Government to accept the changes that local campaigners are seeking. Previous issues that I have championed to Ministers include the extension of the Wendover Green Tunnel and the Stoke Mandeville bypass, which are excellent ideas put forward by local people and are now included within the Scheme. I therefore kept to a very longstanding official visit on behalf of the Government, which had the effect of me abstaining on the Second Reading vote. As you may be aware, Cheryl Gillan, the MP for Chesham and Amersham, said in her speech during the debate that it is important to have MPs fighting the corner for local communities both within the Government and on the backbenches. Decisions about HS2 are taken in Government, by Ministers I work with every day. Last week, I saw the Chancellor of the Exchequer one-to-one and talked several times to the Transport Secretary about changes that you, my constituents, want to see. I am in a better position to do that, as a fellow member of the Government, than I would be as a backbencher, especially one who had deliberately walked out. Patrick McLoughlin’s speech on 28 April did include some of what I wanted. He committed himself to look at further noise mitigation and screening for Western Aylesbury (i.e. from Hawkslade to Fairford Leys) and to making it possible for St Mary’s Wendover to continue as a concert venue and place of worship. I was also pleased by his commitment to continue to work with the National Trust on their idea for land bridges across the line and the reference to Aylesbury UTC getting a share of the training college for HS2. On compensation, the Secretary of State has now said at the Despatch Box that the Need to Sell scheme is not just a relabelled Hardship Scheme but is intended to be more generous. I was also pleased by Mr McLoughlin’s comments that he has made it clear to both his department and HS2 Ltd that there is no place for talk about luddites and NIMBYS and that those affected by HS2 must be respected. I had explained both to him and the Prime Minister how wounding and offensive local people have found that kind of language when it has been used in the past. I hope and expect that we do see the change in attitude that Mr McLoughlin has demanded. These concessions are welcome, but this is not enough. As we go forward to the Select Committee and later Commons stages of the Bill, I shall not rest in pressing for more. I have already discussed in detail with local campaign groups and parish councils the improvements to mitigation and compensation that they want to see and I will continue to lobby my utmost to secure them. One big issue in particular stands out. It is clear to me that a further tunnel is the only way to provide real mitigation for the Chilterns landscape, and more importantly for the people in Dunsmore, Wendover Dean and Wendover. The Bill will now be scrutinised by a Parliamentary Committee, which will recommend improvements. I will argue strongly that a tunnel is essential. Unless a tunnel, and other satisfactory mitigation measures, and compensation arrangements are agreed, I will not be able to remain a member of the Government and will vote against the Bill before it leaves the House of Commons. This entry was posted in HS2 on 6 May 2014 by hvrawebmaster. Government trying to retake HS2 initiative. With the see-sawing of opinion over the last few months it has been difficult to understand where we will end up with HS2. There has been plenty of plenty of news in all forms of media without the HVRA also trying to keep residents informed. However, clearly those against have gradually been building momentum with some large organisations and well known individuals openly speaking out against the project. This has obviously rattled the Government who yesterday issued “The Strategic Case for HS2” and invited journalists to attend a briefing at the Department of Transport. Just to make sure that journalists were armed with the right questions to ask the Transport Minister at the briefing, this leaflet was handed out to all attendees by the HS2 Action Alliance. It makes interesting reading and assuming you are against HS2 is something you can use to further your argument. This entry was posted in HS2 on 30 October 2013 by hvrawebmaster. The National Audit Office (NAO) has warned that the benefits of the HS2 high-speed rail project on the economy are unclear. The NAO said in a report that it had “reservations” about how the London-to-Birmingham link would deliver growth, adding that the project had an estimated £3.3bn funding gap. However, Patrick McLoughlin the Transport Secretary said the NAO’s conclusions were based on old data. Labour said the report was a “worrying wake-up call” for the government. The NAO said it had “reservations about the business case” and said the timetable for the planning phase of the project – with work due to start in 2016-17 – was “challenging”. The department’s “methodology for appraising the project puts a high emphasis on journey-time savings, from faster and more reliable journeys, but the relationship between these savings and the strategic reasons for doing the project, such as rebalancing regional economies, is unclear”. This entry was posted in HS2 on 16 May 2013 by hvrawebmaster. The government has declared a legal victory for the HS2 project after a High Court judge this morning rejected nine out of ten areas of challenge by objectors to the project. However, Mr Justice Ouseley also ruled that the Department for Transport (DfT) acted unlawfully in the “unfair” way it consulted on the issue of compensation for residents living near the planned rail line. High speed rail minister Simon Burns said afterwards that the government would consult again on the issue, but insisted that HS2 would not be delayed. Four organisations had brought five judicial review challenges to overturn government permission for the first phase of the £32 billion project, from London to Birmingham. The ten areas of challenge included claims that the DfT failed to adequately consider alternative routes and had not complied with various European Union environmental directives. The claimants also said that two of the consultation processes ahead of the DfT declaring its support for the HS2 rail link in January, on compensation and the phase one route, had been flawed. According to the DfT, the judge agreed that it was lawful for the government to choose to rule out upgrading the existing network as a credible alternative to HS2. Ouseley also found that the phase one consultation had been carried out fairly and lawfully, the department said. Burns said: “This is a major, landmark victory for HS2 and the future of Britain. The judge has categorically given the green light for the government to press ahead without delay in building a high-speed railway from London to Birmingham, Manchester and Leeds. HS2 Action Alliance (HS2AA), which had brought this area of challenge, said the decision was “a major victory for the more than 300,000 households blighted by HS2”. 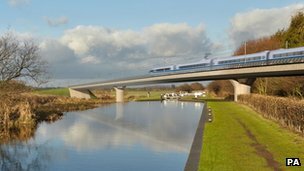 HS2AA, which represents more than 70 local community groups, said it would appeal against the ruling that the European Strategic Environmental Assessment Regulations did not apply to HS2. The three other objectors were: Buckinghamshire County Council, representing 15 local authorities along the route; Heathrow Hub; and Aylesbury Park Golf Club. The local authorities said they would appeal against the decision, while the government said it would be seeking to recoup legal costs from the claimants. The DfT said there would be a consultation on the draft environmental statement for phase one in the spring and a hybrid bill, which would grant permission for the scheme, would be ready by the end of the year. This entry was posted in HS2 on 15 March 2013 by hvrawebmaster. The results of the judicial reviews into the legality of the Government’s plans for HS2 are expected to be handed down at the Royal Courts of Justice next week. A verdict is expected on Friday, March 15, on the five cases submitted in December, covering issues such as consultation on the plans, environmental impact and the impact on communities. This entry was posted in HS2 on 10 March 2013 by hvrawebmaster. A blueprint outlining what Buckinghamshire needs to protect it from the effects of HS2 were described as the county’s “stake in the ground” at a rally this week. 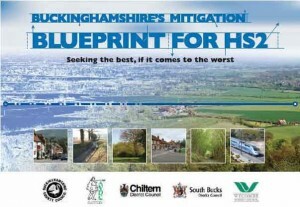 Buckinghamshire’s Mitigation Blueprint – put together by anti-HS2 campaigners and endorsed by the county’s five main local authorities – was publicly launched at the Oculus building in Aylesbury on Tuesday. Campaigners are still hopeful the building of the controversial railway line – set to cut through the Chilterns Area of Outstanding Natural Beauty – can be stopped, but the blueprint is their backup plan, giving details of what precisely needs to be done to stop the county’s residents being affected by the worst of the blight construction would cause. Another copy of the blueprint is on its way to David Cameron, Mrs Brake said, and county council leader Martin Tett said Aylesbury MP David Lidington would present a copy to Chancellor George Osborne this week. View a copy of the Blueprint here. This entry was posted in HS2 on 7 March 2013 by hvrawebmaster.